How much can you save on compliance costs? Only 13% of the organizations Osterman surveyed are “very satisfied” with the way that they manage regulatory compliance issues, despite the fact that 63% consider regulatory compliance to be “very important”. Osterman's research found that you typically spend 19% of your compliance and audit time each year on tracking requirements and another 31% on gathering and maintaining audit evidence. 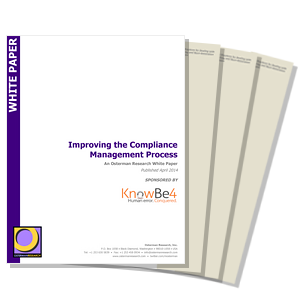 Because these two activities alone consume fifty percent of your compliance efforts, how much can you save on overall compliance costs? Read this whitepaper and find out.